"Magic" redirects here. For other uses, see Magic (disambiguation). And now, Ladies and Gentlemen, the Magic Mouse will make your cheese. . . disappear! Using only the power of his mind (and some smoke, mirrors and pulleys) he can levitate even the largest wheels of cheese off of trap bases, and into the mouths of his lovely assistants. No cage can hold him, and no rope can bind him. . . unless someone other than his lovely assistants is doing the tying, but that's giving his enemies an unfair advantage, isn’t it? The Magic Mouse is attracted only to SUPER|brie+. No Charms are required to attract the Magic Mouse. Hunters can encounter the Magic Mouse in the Harbour, King's Arms, and Town of Gnawnia locations. The Magic Mouse is not known to drop any loot. Attraction info and special event loot drops for the Magic Mouse can be found at the individual event location pages. The Magic Mouse drops the Magic Egg during the annual Spring Egg Hunt. 30 June 2010: The Magic Mouse was released as part of the Windmill update. 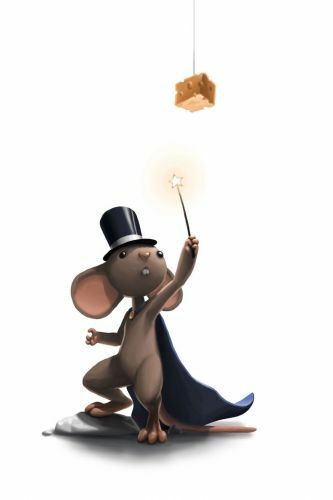 12 January 2011: The Magic Mouse could be found at Ronza's Traveling Shoppe where it dropped Luck Charm and Rockforth Cheese as loot. 14 April 2011: The Magic Mouse began dropping a bonus Magic Egg as loot as part of the Spring Egg Hunt 2011 event. 25 June 2013: The Magic Mouse gained a vulnerability to Law power type traps, with the release of Varmint Valley. 25 March 2014: The Magic Mouse gained a vulnerability to Rift power type traps, with the introduction of the Rift Plane. This page was last edited on 11 February 2018, at 19:16.